FAD caught up with Swiss artist Stefan Behlau during his exhibition BANZAI at PM|AM and ahead of his first institutional show with Dennis Loesch at the G2 Kunsthalle in Leipzig which opens today (Friday 27th November). My work is usually project based and serial. For my current series of Spread Paintings I partly engaged with the idea of painting in and of itself. One of the mental starting points for this body of work was the question of what it was, that constitutes a thing as a painting? Or what does a painting have to have to be a painting. In a classical sense: A body of paint (or substance composed of solid colouring matter in a liquid medium) applied to a suitable surface such as canvas. I wanted to find a way of creating these straight-forward paintings whilst taking myself as creator out of the equation. The questions an artist sometimes asks himself/herself are: What am I doing? How am I doing it? Why am I doing it? I do not want to find a subject matter other than maybe painting itself and so I came up with a semi automatic way of producing things (paintings) that essentially are no more than a straight-forward presentation of paint. At least that is where this started. That is a good question. I believe these things just develop organically. Even when a project seems finished sometimes, there still seems to be plenty of matter flowing or spilling over into the next. You are always laying building blocks for the following steps ahead. It is daunting to think of an ending or even the possibility thereof. A final destination. The moment a search/exploration or journey is finished, completed and over. And what if there is no urge to look further or at something else? What happens when we are done-done?! I find that many artists, when they reach such a point, they either start gardening, play chess excessively, do social work, fall prey to addiction or they commit suicide. 3. How has it been working with PM|AM on your exhibition? A really great experience. They are very forthcoming and have a real fresh drive. And open to ideas, which is so important! Also: They are genuinely concerned about the artist, their well-being and the development of their work. 4. Can you tell us about your exhibition BANZAI? BANZAI is my second show with the Spread Paintings. It is my first exhibition in the UK. Banzai is (also) a term surfers use before they pitch down a gnarly wave. I like the word because it relates to the paint’s wake, as it is spread across the canvas. It is a further exploration of colour. And here I am also introducing new proportions and my first one-colour-pieces (two tone). These new dip-style paintings may be leading me and this form of colour exploration to a conclusion. We may have come full circle in explaining or showing what it is that these paintings really are (or what they have been meaning to present). Because there is no more battling between the different chromatic hues: Here – as one tone – paint exists as pure form! 5. How do you choose the colours in your paintings? Colour card layouts. Acrylic colour sketches. Many of them. Sometimes I revisited paintings by other artists and borrow a speciffic picture’s palate. The resulting painting then gets it’s title in reference to the original. I love to seep through colour theory books and charts, but in the end I find random colour configurations (if they pan out) to be most striking. Of course the biggest influence may be the California based paint manufacturer I use. 6. 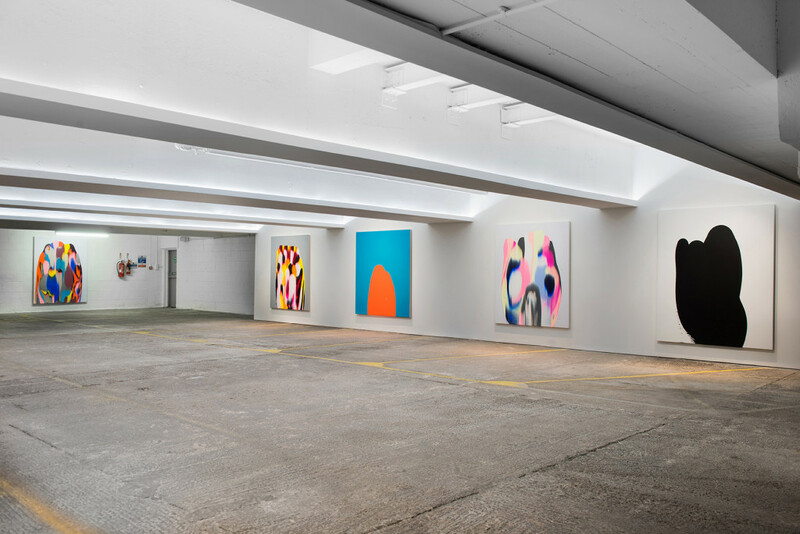 Did you create the works specifically for a below ground exhibition space? 7. After BANZAI what do you have planned for the rest of 2015 and early 2016? in Leipzig from November 27, 2015 until February 21, 2016. Hoping for a short winter break after that and then I want to work on some publications and pick up on a few projects that have been on hold since I started the spread paintings. Stefan Behlau Born in 1979, Zurich, Switzerland.Lives and works between Brussels and Santa Barbara. 2001–06: B.F.A., Pratt Institute, Brooklyn, New York. It is the modernist notion of surface, and the complexity of its visual implications, that German painter Stefan Behlau continually explores through his artistic process. 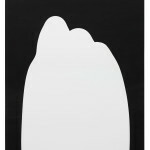 Having received his BFA in Drawing from New York’s esteemed Pratt Institute in 2006, Behlau’s investigation into paint as a material substance is largely informed by the pigment’s ability to expel a surface of interiority – to flatten, obscure and reorient an image into the presence of its two dimensionality. 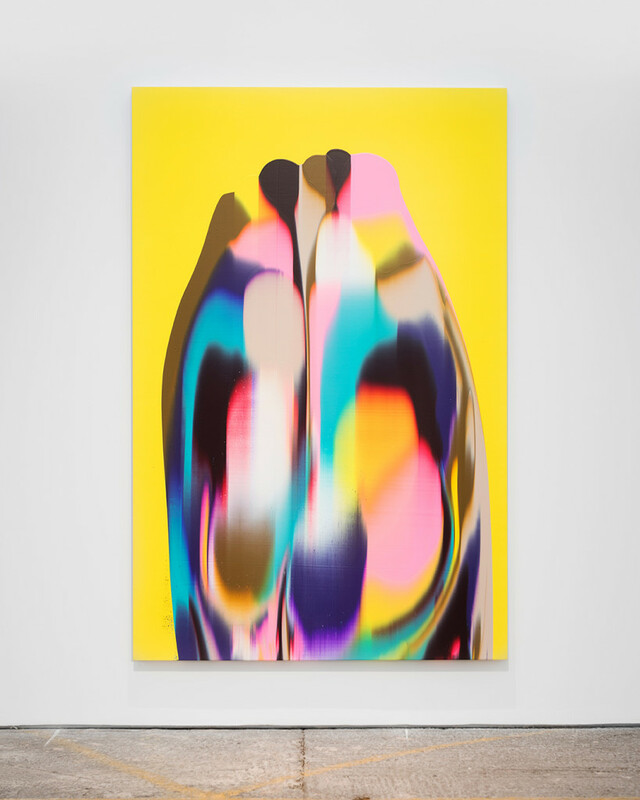 As evident in his earlier works, such as Stereo Views and Mohawk series, surface as it relates to mechanical reproduction becomes a focal point for Behlau. The incorporation of tight, overlapping and contrasting color juxtapositions forgrounded on appropriated images is used as a tool for undermining photographic narratives, and referencing the canvas’ facade. Behlau’s prowess for the materiality of the medium has since evolved into a painterly abstraction. 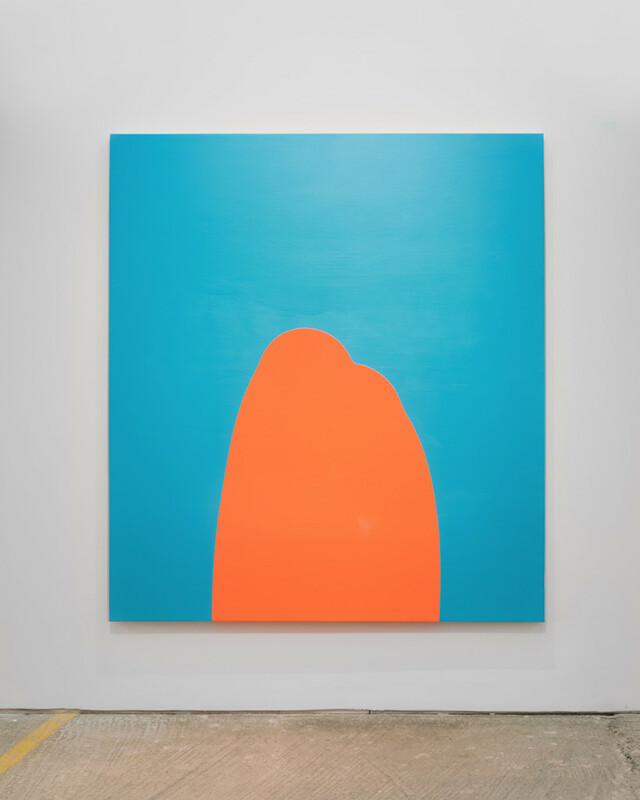 This is most clearly visibly in his ongoing Nova Colors series, large-scale color field works that are produced through the ceremonious pouring of Nova Color brand paint onto canvas; the pooled liquid is then pulled across the surface with an aluminum blade creating butted bands of pigment. 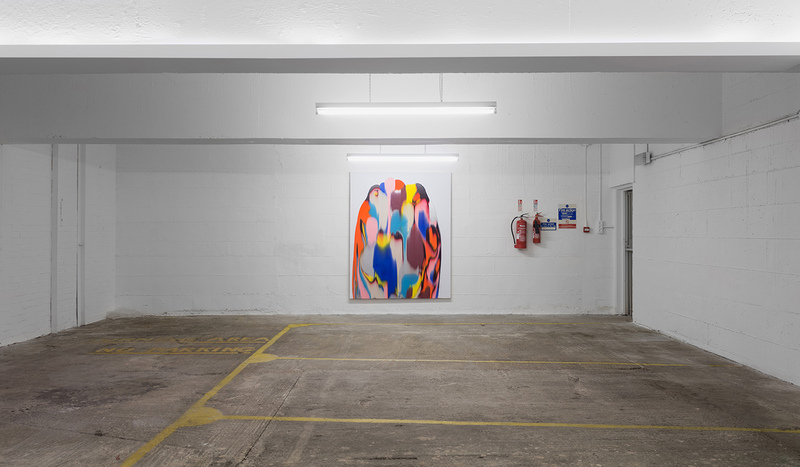 Like oil against water, the visual properties of the paint become more pronounced through their opposition to the other, revelling in their density and saturation. Stefan Behlau has been exhibited in the USA and Europe including exhibitions at Dittrich & Schlechtriem (Berlin), Niklas Schechinger Fine Art (Hamburg), Art Center Los Angeles, Angstrom Gallery (Dallas) and Regina Rex (New York). This entry was posted in INTERVIEWS, NEWS and tagged Stefan Behlau. Bookmark the permalink.